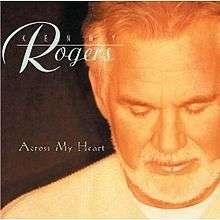 Across My Heart is the twenty-second studio album by country superstar Kenny Rogers. The album was produced by Magnatone Records, and features a wide array of superstar talent collaborating with Rogers on various songs on the album. The album did hit the charts, with its strongest showing on the country charts at number 26, but it did not produce any singles. Artists included in collaborations on the album include All-4-One, The Katinas, Tareva Henderson and Bekka & Billy. Allmusic's Stephen Thomas Erlewine rated it 2.5 out of 5 stars, saying that " Even with all these collaborators, the album sounds homogenous, especially since the material is entirely generic. However, it holds together better than most Rogers albums since the mid-'80s, because it is evident that some thought and care went into its production."